1. Tear out magazine pages. Trim edges to make clean edges. 2. Take skewer or knitting needle and place at left corner of page on the diagonal. Begin to roll magazine page. When you reach the end you will place a small amount of Elmer’s glue to hold in place. Do not worry if you have some leak out. It will dry clear and be painted with MODGE PODGE later on. 3. Make many tubules out of these pages. When you roll be sure to have the most colorful side of the page faced downward. As you roll, the downfaced side will become the outside of the tubule. 4.Store tubules in a place where they will not be damaged until you feel you have enough to cover the container you have purchased. NOTE: ROUND CONTAINERS ARE EASIER TO DO THAN THE ONE PICTURED IN PHOTOGRAPH WHICH HAS A FLAIRED EDGE. 5. When you think you have enough to go around your container,start pairing the colors you would like to have next to each other. My son likes browns and green so I picked out those colors from my array of tubules. 6. Place one tubule next to your container and cut to size. Cut top of tubule first then turn tubule upside down with now flat part on bottom of your container then cut the top of tubule to the height of your container. Use this as a guide to cut the rest of the tubules to same size. 7. When all tubules are cut begin placing hot glue in straight line onto your container and attach tubule to container. Take care to note where it was tubule was glued shut so you do not leave that part facing outward. This will ensure down the road that it will not unravel on you. 8. When all tubules are in place turn off glue gun . Find something that will support your project while it dries. ( I used a half gallon milk container filled with water and turned the waste basket upside down onto it. 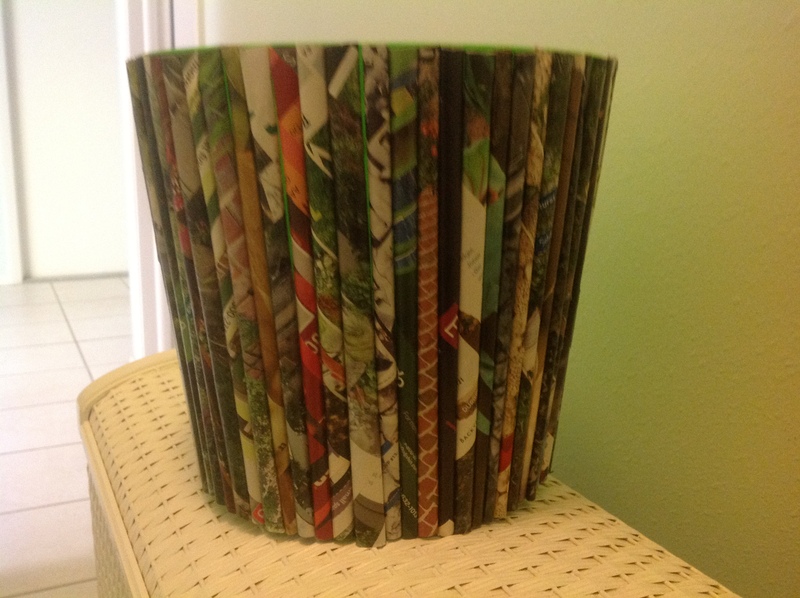 )Then you will begin painting magazine page tubules with two thin coats of glossy MODGE PODGE . Let dry between coats. 9. While you are waiting for it to dry cut four inch pieces of plastic clothesline till you have many. You can always cut more if you run out. 10. Place about one inch or so of the clothesline inside of a tubule and skip the next tuble and inset other end into the following tubule. The second piece of clothesline will be placed into the second tubule that you skipped over and then you will skip the next tubule from where it is inserted and insert into the following tubule.BE SURE TO ALWAYS WORK BEHIND THE LAST PIECE OF CLOTHESLINE THAT WAS INSERTED TO GET THAT BRAIDEDLOOK. Then it becomes tricky. 10. SO LETS REVIEW …….SO FAR , CLOTHESLINE PIECE ONE HAS IT’S END IN TUBULES ONE AND THREE. THE SECOND CLOTHESLINE PIECE HAS ITS ENDS IN TUBULES TWO AND FOUR. The next clothesline piece will be placed in tubule three which already has one piece of clothesline in it. This makes it snug. YOU MUST INSERT FROM BEHIND THE ONE ALREADY IN THE TUBULE THREE AND SKIP ONE AND PLACE INTO TUBULE FIVE. the next piece (always inserting behind) will be placed into tubule four behind the piece already in there and skip one and put into next which will be tubule six. Once you realize the pattern, you do not have to count. Do this all the way around. Then repeat on bottom of container. 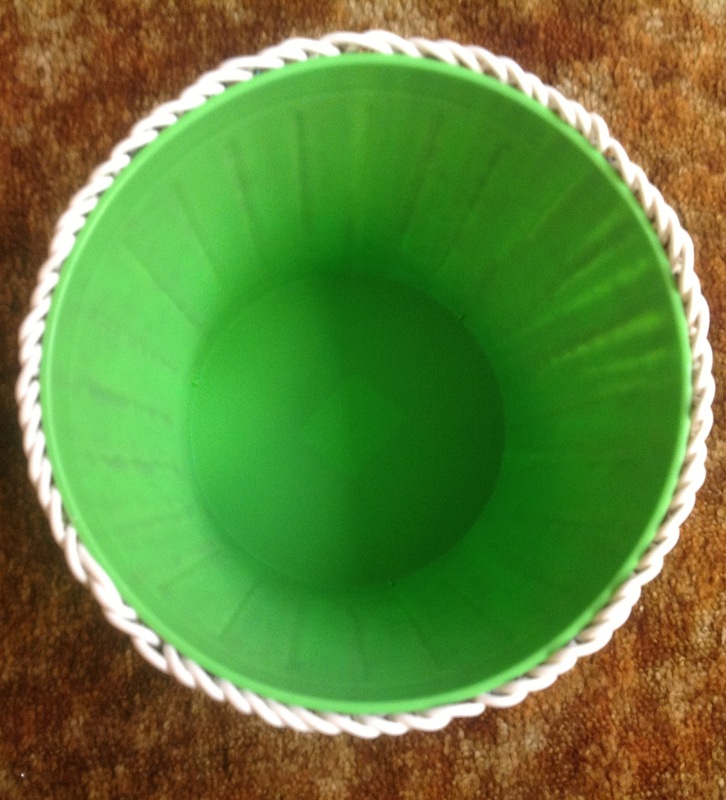 This is decorative as well as functional as if you have water on the floor the paper tubules can absorb but with the plastic / vinyl clothesline it is easily dried with a paper towel and doesn’t ruin the basket. NOTE: you can decorate oatmeal containers and place barrettes and hair accessories inside. Or use to place a cylindrical vase of flowers inside. The possibilities are limited only to your imagination. Hope you give it a try. Have fun!